So, you’ve been dating your significant other for a while now, and you really want to do something big this Valentine’s Day. You’re over the fancy dinners, you’ve spent more on heart shaped chocolates than you care to admit, and if you have to sit through one more cheesy Valentine’s Day romantic-comedy movie your relationship might not last long. So what do you do? Bury your hopes for an exciting, fresh Valentine’s Day, and begrudgingly purchase the gourmet chocolates and fuzzy teddy bear that the salesman at the department store is trying to shove down your throat? Of course not! Couples today thrive on celebrating the bold, and experiencing new adventures, and what better time to do that than Valentine’s Day? That’s exactly why we’ve decided to bring you this list of adventurous, unique Valentine’s Day date ideas, that will take your love to new heights! So forget the fancy dinner and leave the heart shaped balloons at home, and get ready for a romantic, adventurous Valentine’s Day your sweetie won’t soon forget! Everyone feels better after getting some fresh air, which is why we’re huge fans of going for a scenic Valentine’s Day hike! We love Gunpowder Falls State Park’s Wildlands Loop, but if you’re not in the Baltimore/Washington D.C. area, a quick Google search of local hiking trails will show the best trails in your area! Pack a light picnic lunch to enjoy during your hike, and spend the day enjoying the great outdoors! A step up from the traditional Valentine’s Day dinner, a wine tasting at a local winery is a great way to experience Valentine’s Day with your sweetie. Sample local wines and enjoy light fare in an intimate, rustic environment. We love Boordy Vineyards, a Maryland based vineyard, but there are sure to be some great vineyards near you as well! Ask friends or your local wine store for recommendations, or do a quick internet search to find wineries near you! Okay, we might be a little biased, but this is one of our favorites. 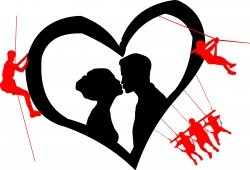 What better way to experience Valentine’s Day than literally taking your love to new heights! Our Romantic Adventure is perfect for couples of all fitness levels, and gives you the opportunity to experience the entire Terrapin Adventures Challenge Course. Spend the day challenging and encouraging each other as you reach new heights, then enjoy hot chocolate and sweets indoors after the event! Experience the city with a romantic guided or self-guided tour of the Nation’s Capital, or a local trail in your area! Go at your own pace, and stop to take memorable photos along the way! For the really adventurous couples, take a weekend getaway to a ski resort near you! Hit the slopes, then cozy up by the fire in the ski lodge afterwards. This entry was posted on Wednesday, January 14th, 2015 at 10:00 am. Both comments and pings are currently closed.